I'll start here by saying that I loved this book. It's only February, and it's already my favorite crime novel of the year. Let's just say that in terms of current crime fiction, something absolutely spectacular is going to have to come along to move it down the list from number one. Claudia Piňeiro is also at the top of my list of contemporary crime writers, and with good reason. In all of her books, she has this uncanny knack of being able to put her characters into some pretty extreme situations and then we watch as they exercise their consciences (or not) and act accordingly. The results are always beyond amazing, supporting my idea that the best crime fiction doesn't necessarily have to be plot driven -- what people do and why, what they discover about themselves, and in some cases about the society in which they live, is why I read crime. People who have not read Claudia Piňeiro's work are missing out on some of the best crime writing of our time. As was the case in her Thursday Night Widows, the author takes us back into that bastion of elite privilege, the gated community in Buenos Aires. This time we are at the Maravillosa Country Club, where after going through the regular rigorous security measures to get in to clean the home of Pedro Chazarreta, Gladys Varela gets to the house, starts her routine, and sees Chazaretta sleeping in a green velvet, highback chair. Deciding to clean up a bit of whisky that's spilled on the floor from an overturned glass, she discovers that Chazaretta is not sleeping at all, but dead, throat slit and holding a bloody knife in his right hand. Despite its tightness of security, Maravillosa had been the site of another, earlier murder, that of Chazaretta's wife Gloria. He had been the prime suspect in her death, but "on the grounds of lack of evidence," the case was dismissed. Her murder had been committed in exactly the same way, and privately, people are saying that the way in which Chazaretta was killed is what he deserved, since most people still believe that he was Gloria's killer. Chazaretta's death and the coverage of events marks the beginning of a partnership between the three main characters in this novel. First there is Jaime Brena, an over-sixty former crime writer for the newspaper El Tribuno,who has been demoted and is now dealing with society news such as writing pieces about surveys about sleeping face up or face down, the occasional preschool opening, and other such mundane or ridiculous assignments. The crime beat was given to the "Crime Boy," who is the new kid on the newspaper staff, and who, as Brena sees it, is "Very soft. Generation Google: no legwork, just keyboard and screen, everything off the Internet." He has zero clue how to do his crime reporting job, and Brena actually feels sorry for him, and decides it can't hurt to take the kid under his wing. The third leg of this triangle is Nurit Iscar, the titular Betty Boo, who until she decided to change direction and write a romance novel, was known as "the Dark Lady of Argentine literature," for her mystery/crime books. However, a bad review of her romance novel took her out of the world of fiction writing altogether (except for jobs as a ghostwriter) but she has been tasked by the editor of El Tribuno (who used to be a lover of hers) to provide write-ups about the Chazaretta murder from a home the paper is using in Maravillosa. When the three put their heads together, this trio of loners discover that something horrific is going on, and that the deaths at Maravillosa are just the tip of the iceberg. "Millions want to be informed. Terror is based on lack of communication. Break the isolation. Feel again the moral satisfaction of an act of freedom. Defeat the terror. Circulate this information." "Today the high priests of journalism, or 'intellectuals" in inverted commas, are happy to sound off from the safety of their studies or their holiday homes. And they think they're important because they're 'opinion-formers.' ... Many of them will offer up as an irrefutable truth something that's nothing more than their own opinion. Or the opinion of the people they work for." Piňeiro also reveals the implications of a "news agenda that leaves out certain stories," often allowing perpetrators of major crimes to walk free. It is these "unpunished crimes," Pineiro notes, that "always conceal something more terrible than the crime itself." For my money, she's hit the nail on the head. Considering that this is a novel from Argentina, this topic carries a lot of historical meaning and a lot of historical weight, but I could feasibly make the same argument about journalism and the media in this country, or for that matter, any other country where powerful people have the means to control the truth. 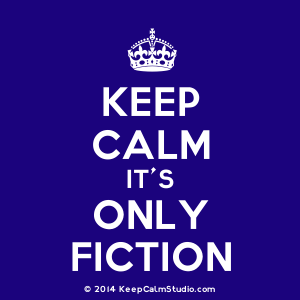 As Nurit Iscar also notes, novelists have a responsibility as well -- to present "another reality, an even truer one," in the guise of fiction, since they "don't have to answer to any one." Of course, there's so much more in this novel, and it is one you could read solely for the murder plot. However, the truth is that Betty Boo has a richness and a depth that is rarely found in crime writing these days, and it is that kind of something so out of the ordinary that I look for when I pick up a crime novel. This book is another one that left me stunned because of how very perceptive it is -- and I can't speak highly enough about it. I have Thursday Night Widows. I will read that one first. Tracy, I LOVE her work. She is just an amazing writer. Her A Crack in the Wall was just phenomenal. Thanks. She's easy to write about since I love her writing. There's quite a bit of humor in here to balance out the darker stuff, so it works well. Interesting you should have read this book and posted a rave review while I just got this book out of the library. And I was pleasantly surprised when the library system had all three of the Bitter Lemon books I reserved. This includes Anita Nair's A Cut-Like Wound, which is about as far from my comfort zone as it can get. I've read three books by Piniero and liked Thursday Night Widows and A Crack in the Wall -- a lot of in-depth character development. 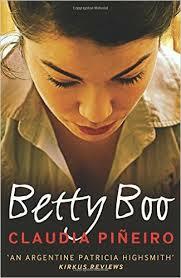 My only problem with Betty Boo is that the paperback has very few paragraphs. And with these aging eyes, I got eyestrain and a headache just looking at the book. May need new glasses before I venture into it. As far as journalism goes, I coouldn't agree more. Actually, I criticize journalists and the media for not criticizing Trump, Cruz and Rubio much more. How many have called Trump on his uber-racist appeal and crushing of independent inside his rallies? How many have taken on Cruz? Rubio? And even Hillary Clinton? A lot of her opinions, lobbying, push to war, have been criticized by activists and some media, but not all. The style definitely takes a while to get used to, but once you're there, it is such a good book! I love the focus on friendship and mentoring as well as the main thrust of the story. I've quit watching the news via regular media some time ago. Nancy, this is simply well written and incredibly perceptive: I would love to read this and Thursday Night Widows; I think they would be captivating---I am interested in the historical aspect of South America ( for many reasons), and for now, I need to escape from the ANGRY media; I also embrace friendship and the idea of mentoring is also appealing. Oh, and its witty! The discussion about flappers is politically perceptive. But Dorothy Parker wrote a hate song to flappers! Really. I'm laughing about once a page, although it's slow-going due to the layout style. The style is doable -- very different but it will stop bothering you. I laughed in some parts, too. The friends she has are hysterical. Yes, I'm enjoying the outright humor and the more subtle humor. Well, I finished this book and while in an unusual format which will send me to get new glasses, Pineiro had a lot to say. I enjoyed the main character and the plot, but the political undercurrent made it an important read, especially from an Argentinian writer. The book did make good political points about crime and journalism, its ethics of lack therein. I didn't know about Rodolfo Walsh, but unfortunately he was standing up to the generals with integrity and courage. I have read the other three translated books by this author and will always look for more. Bitter Lemon Press is a publisher whose website should be checked often to see what other treasures are lurking there. I'm so happy you liked it, Kathy! The only bad thing is that now we have to wait for another Pineiro novel to be translated! Also, if you're a movie buff and haven't seen the Argentinian film, "The Official Story," you should. It is about the awakening of an Argentinian teacher and parent to the realities of the "Dirty War," and stars the great Norma Aleandro. It is a classic. Can you please tell me the name of the book with Evita Peron in it and other elements, which sounded like fun? I'd like to try it. It's The Adventure of the Busts of Eva Peron, by Carlos Gamerro.